With its array of Autumnal colours, October is a wonderful almost magical time to explore the British countryside or coastline. Whether you like to explore villages and towns or take to the countryside October is the perfect time to go on a self catering cottage break or holiday in the UK or Ireland. Although in October the nights are starting to draw in and the air is certainly cooler, the weather often tends to be dry with blue skies... giving you crisp bright days for walking and exploring. With chilly evenings in prospect a self catering cottage is the perfect choice for an October break, giving you somewhere nice and warm to relax in at the end of your day. What's more you can choose cottages with a log open fire to cuddle up in front of or how about a cottage with a hot tub to chill out in each evening? Of course you are not restricted to traditional cottages, check out some of the self catering options below including bungalows, chalets, lodges, log cabins, holiday flats and apartments. A holiday cottage break in October is also kinder on your wallet, as accommodation prices are much cheaper than in the peak season. You will also find many of the popular cottages that are solidly booked throughout the main summer are available in October so you can have your pick of the best. Check out some great Cheap October deals across England, Scotland, Wales and Ireland below. If you want to get away this October it doesn't have to cost the earth, whether you are looking for budget or luxury accommodation, there is some great self catering. 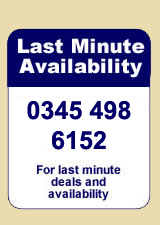 To get some great last minute cheap October deals and latest availability we recommend calling 0844 847 1143 for a selection of cottages, apartments, lodges and more. If you are not sure whether to start your October cottage and self catering search here are a few favourite cottage holiday locations, from popular counties to wonderful locations in England, Scotland and Wales, to get you started. Whether you are heading away for a October weekend break, short break or holiday there are still lots of things to do and see, whatever the weather. Traditionally October is known for its Harvest Festivals and increasingly for Halloween which tends to mean you will find events in villages and towns across the UK. In addition check out our Sporting and Social Events, Festivals and Events, Gardens to Visit and County Show Guide for lots to do and see across the UK this October.